History to Fly at Thunder of Niagara 2018! Home > History to Fly at Thunder of Niagara 2018! Scott Yoak is bringing his “Quick Silver” P-51D Mustang to the 2018 Thunder of Niagara International Air Show, June 9 & 10 at the Niagara Falls Air Reserve Station! Come relish in this Mustang’s distinctive roar courtesy of a full-tilt aerobatic demonstration! Scott is a Graduate of Embry-Riddle Aeronautical Univ. Started flying airshows while in college and checked out in the P-51 at the age of 20. While attending ERAU, Scott obtained all of his flying ratings as well as his Mechanic ratings. 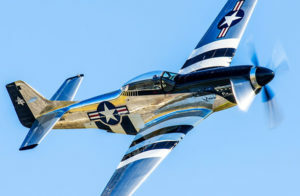 Performing in 15-20 Airshows a year, he has earned the reputation as one of the best pilots flying World War II aircraft in shows today. When not touring the show circuit, Scott is home in West Virginia carrying on the tradition of making the most difficult parts for warbirds. “This P-51 is a celebration of our nation’s armed forces. Every aspect of the paint represents those who have served, and those who gave the ultimate sacrifice. The black cape covering the front of the aircraft represents the veil of protection that our armed forces give us. That veil is one of the reasons why we have what we have today, freedom. As the cape extends to the back of the canopy, it spreads out and divides into feathers, symbolizing the eagle that has flown with every aviator since the birth of aviation in 1903. The black paint has tiny sparkling stars in it, each sparkle represents an American Veteran that served our great country; the unsung stars in our lives. These veterans are the glimmering star in a mother’s eye, a wife or husband’s heart, a son or daughter’s hope for the future. The silver ring behind the spinner represents the shining halo of the guardian angel who guides service personnel, having given the ultimate sacrifice, to their final resting place. The black and white stripes on the wings are there, as they were on all allied aircraft on D-day. The stars and bars, proudly displayed, represent the armed forces symbol that all United States fighter planes carry. It carries the post war version because ‘Quick Silver’ was never a part of a unit till after World War II. All of the bare metal of this P-51 Mustang is polished. Look closely into the metal, you can see for whom our veterans fought. Bill Yoak, an individual with a love and passion for this type aircraft, did all of the metal work. The re-manufactured parts are handmade. Unlike the hurried war effort parts, these are made with the skill and care of a master craftsman, and obtain the utmost attention to detail necessary to restore this Mustang to a condition better than factory new in 1945. As always, please keep a watchful eye on your inbox. I promise you, more fun is on its way! Insider ONLY Online VIP Ticket Launch – May 17th at Noon ET! VIP Tickets go on sale (ONLINE & to Insiders ONLY) tomorrow … May 17th, at 12:00 PM (Noon) Eastern Time. Tomorrow at Noon Eastern, you’ll receive an email, promo code, and special Insider ONLY link to purchase VIP tickets. If you have family and friends who might be interested in saving up to 50% OFF* VIP tickets, please have them sign-up to become an Air Show Insider on the Thunder of Niagara website home page. VIP Ticket prices go up on May 21st. *Nominal Ticket fees may apply.